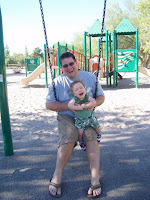 Cam had a fun trip to the park with Chris and Jane and tried out the swings with Chris and the slide with Jane. Grandma & Grandpa accompanied Chris, Cam, Great-Grandma Mary and Henry to the Botanical Gardens where Cam saw the Chilluly Glass. A little swim in a cool hot tub was a highlight for the big boy. Cameron loves to splash around. 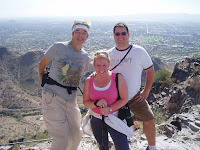 Chris & Jane had a big hiking trek up Squaw Peak with Henry, while Cam stayed with Grandma & Grandpa. In a few years, they will definitely be taking Cameron on an Arizona hiking trip. To finish up the great week, a mini family reunion was held at the rental house. Cameron met his second cousin, Ava, fo r the first time. She is almost 2 years old and was quite fascinated with Cam and his toys.